Miscommunications are common in healthcare. The Affordable Care Act addresses the need for shared decision making and patient education in medical practice to close these communication gaps. 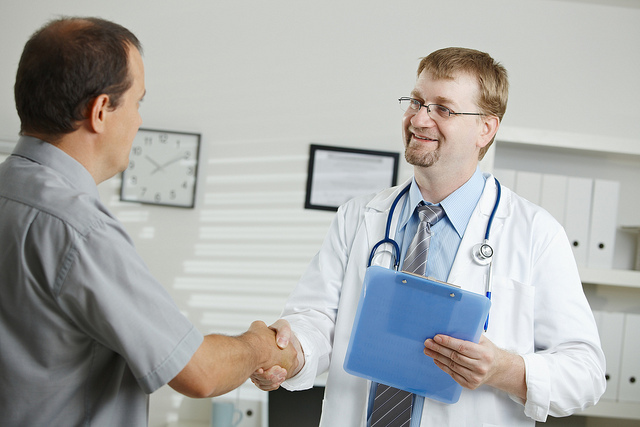 Shared decision making and patient education engage the patient to improve their understanding of their medical conditions, making them more likely to ask questions about their treatment and how to follow guidelines. A new study shows that shared decision making may be effective in improving patient education, though it’s not conclusive. Patients do not follow their medication guidelines appropriately about 20 and 50 percent of the time. And 21 to 42 percent of patients with diabetes do not adhere to their medication guidelines. Engaging patients and their families in decision making offers a reliable option for improving health outcomes. The Office-Guidelines Applied to Practice (Office-GAP) research study was conducted at Michigan State University College of Human Medicine. The research program addresses communication barriers between patients and physicians by working with low-income, minority patients with diabetes, heart disease or both. “Communication is part of medical care, it is not optional,” says William Hart-Davidson, Office-GAP co-author. The program is creating a culture with more transparency between patients and physicians. Office-GAP is providing doctors and other staff with communication training and educating patients about shared decision making and helpful educational tools. As a key part of the study, the program holds group visits for patients to receive personalized attention from their physicians. Group visits give doctors the opportunity to take more thorough information concerning the patients lifestyle by spending more time with the patient outside of the clinical setting. Group visits give patients and physicians a chance to find the medication that works best for the patient and to express their concerns. In order to keep the conversation going effectively, Office-GAP developed a checklist tool for doctors and patients to use during follow-up appointments. The paper was published in BMC Health Services Research and explains that a patient’s likelihood of adhering to their medication guidelines increased by 52 percent after six months in the Office-GAP program compared to traditional care. After 12 months, medication adherence was still 34 percent higher than patients without decision making training, although researchers couldn’t rule out that other factors may have caused that difference. While enrolled in the program, patients meet with clinical research assistants at their doctor’s appointments, which are generally scheduled three months, six months and 12 months from the day they join the study. At the follow-up appointments patients complete a questionnaire and get $10, a friendly incentive for attending the group visit and two follow-up appointments. The study is currently being funded by Michigan State University, but going forward the study is seeking funding from the National Institute of Health. Hart-Davidson says that researchers hope to add a text messaging feature to the program. Ashley Lyles graduated from Michigan State University, majoring in professional writing with a concentration in digital and technical writing. Ashley also did pre-medical coursework. As a scholar in the Research Education Program to Increase Diversity in Health-Related Research, she conducted biomedical research funded by the National Institutes of Health. Passionate about global health, Ashley has traveled to Honduras to participate in a medical and dental brigade. You can follow Ashley on Twitter here. Hm&0m#823m;I might have to do that, or just hit up the local flea market and move ‘em. Madden 10 for Scooby snacks? LMFAO!!! Yeah I know, it’s going to be a struggle trying to get rid of it.